Swaledale is a very beautiful and typical limestone Yorkshire Dale with a narrow valley bottom road, the unpredictable River Swale, green meadows, fell side fields, white stone walls, limestone barns and lots of sheep. It runs broadly from west to east from the high moors of the Cumbria–Yorkshire boundary at the watershed of Northern England, where Nine Standards Rigg rises, to the market town of Richmond. A number of small dales to the south of the rigg join to form the narrow valley of Upper Swaledale at the small village of keld then at the village of Thwaite the valley slowly broadens out to take in the villages of Muker, Gunnerside and Reeth before reaching Richmond. Swaledale is home to many types of flora and fauna. Over the last few years the national park has been restoring 495 acres of upland and lowland to bring the traditional hay meadows back to their former glory, as part of the Hay Time Project. The process of not cutting the grass for hay or silage until wild plants have seeded provides a profusion of wild flowers in the spring and summer. Tourism has become very important in Swaledale attracting thousands of visitors a year especially with walkers as The Coast to Coast Walk passes through the valley and there are many public rights of way and open access land for all the family to explore and enjoy in this wonderful dale of Swaledale. Arkengarthdale, a subsidiary dale to Swaledale, is the most northern dale of the Yorkshire Dales and is the valley of Arkle Beck. It is a beautiful peaceful and quiet dale of pasture land and hay meadows scattered with sheep farms and stone barns. The road that runs through the dale from Reeth passes through the hamlets of Raw, Arkle Town, Langthwaite, Eskeleth and Whaw and the road eventually reaches the Tan Hill Inn the highest in England. A narrow no-through back road from Langthwaite leads to Booze. Arkengarthdale is famed for being featured in the mini-series “A Woman of Substance” and the popular TV series “All Creatures Great and Small”, based on the books of Thirsk vet James Herriot. Arkengarthdale was once the busy centre of a lead mining industry largely developed by Charles Bathurst, Lord of the Manor in the 18th century. The area was mined for over a thousand years and although most of the mining structures have disappeared the spoil heaps and the lines of an 1100 metre long chimney, from the site of the smelting mill, are still evident on the hillsides of the valley. Langthwaite is an idyllic village in Arkengarthdale and one of the most northerly in the Yorkshire Dales National Park. It is classed as the main settlement in the dale and is home to a shop, a pub The Red Lion, an unusual commissioners’ church of 1817 and also a hexagonal powder house built in 1807 to store gunpowder used in the many mines dotted around the area. Booze is a hamlet situated high on the hillside about a mile from Langthwaite and overlooks Slei Gill which contains several lead mining levels. During the 18th century a group of miners working underground near Boldershaw blasted into an underground lake drowning twenty four miners, eighteen of which came from Booze, and two pit ponies in the flood that followed. The vein became known as the Water Blast Vein. After the decline of the lead mining industry in North Yorkshire at the end of the 19th century one of the mines, the Booze Wood Level, continued to be used as a slate mine until the beginning of the First World War. In July 2008 Royal Mail withdrew postal services from Booze on health and safety grounds due to the excessively steep rural track leading to the village and was resumed after the council made road improvements. 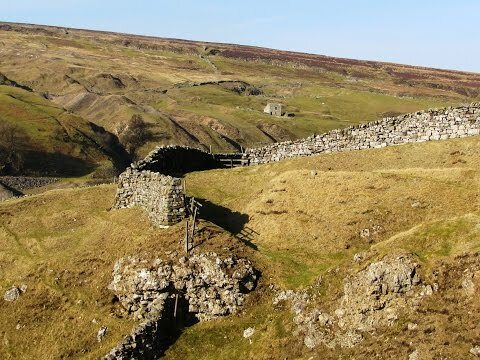 Fremington Edge is a 5 km long wall of crags and scree slopes situated north of Reeth where Swaledale and Akengarth meet. The Edge is scattered with the remains of old Lead mines, disused shafts and spoil heaps. Chert was mined on Fremington Edge until the beginning of the Second World War. We park on The Green in Reeth and walk down the road to cross the bridge over Arkle Beck then we go through the stile almost opposite and turn left to follow the beck on our left. We walk over the field, go through the gate into the next field and keep to the right of a barn. We go through the gate next to two trees into a field and head forwards bearing right uphill at the mound. At the wall corner we go over the stile and head uphill passing to the left of a barn to the next wall where we go over the stile and turn left. We now follow the bridleway uphill then downhill with the wall on our left and Arkle Beck down below. We go through a gate passing through a wood close to the beck. We go through another gate and keep heading forwards through the fields, going away from the beck, and passing to the front of an old derelict farm house, until we come to Castle Farm House. We turn right through the gateway then left and cross the field to the corner and go over the stile and head forwards. We start to follow close to the beck again and keep heading forwards past a bridge over Arkle Beck. We come to a stream coming in from the right and cross over a small footbridge and go through a gate on the left between Arkle Beck and the wall. We head forward through an old tip then go through a gate in a tunnel entrance and walk through the wood uphill. We come out of the wood onto a track which leads us past a bridge over Arkle Beck and then to the bridge at Langthwaite where we bear right through the houses. We keep following the road round to the right going steeply uphill to Booze. At Booze we turn right at Town Farm and go through a gate into a field. We head downhill to a track and turn right and then left just before a gate and head downhill to a farm. At the bottom we cross over the footbridge and pass in front of the farm and turn left through the gate at the sign post for Hurst. We follow the walled track steeply uphill then follow the wall on the left to a gate. We go through the gate and turn right still going uphill we follow the path through the disused mine tips and shafts. On reaching the top we head forwards to go through a gate in the wall and turn right. We are now on Fremington Edge. We keep heading forwards following the wall on our right. We pass a gate and incoming path on the right. When we get to a wall coming in from the left we turn right through the gate and head downhill on the left hand track. We go through a gate and then take the path on the right 100 yards before the white house. With the white house on our left we go over the gated stile and turn left downhill following the grass track. We go over the stile and head downhill to the right of the barn. We go over the stile and make our way to Arkle Beck. We now follow the path we started on turning right over the bridge and follow the road back into Reeth. This is a moderate to hard walk on grass paths, tracks and some road. There are some very steep inclines and declines. Elevation: Lowest point 182.50 metres (598.75 feet) Highest point 468.9 metres (1538 feet). Approx 8.75 miles allow at least 3 hours 30 minutes using OS map OL30 Yorkshire Dales, Northern and Central areas. Wensleydale, Swaledale. Start point: At the Green, Reeth. Reeth in Swaledale and Langthwaite in Arkengarthdale in the Yorkshire Dales. From A1 take the A684 to Bedale. At the t-junction in Bedale turn right for Layburn. At the small roundabout at Layburn turn right and then left for Reeth. At the cross roads cross straight over and follow the road over the top and down to Grinton turning left at the t-junction then into Reeth OR from the A1 and A66 junction take the A6108 through Richmond, carry on bypassing Marske and then take a right turn onto the B6270 to take you to Grinton then Reeth. Parking is central on The Green. There is a voluntary fee of £1. There is also some road side parking. Fridays are market day held on The Green so parking will be limited. There are public toilets at Reeth near the Buck Hotel and also at Langthwaite and nearby Grinton. For refreshments there are three hotels/pubs The Black Bull, The Buck and The Burgoyne, four tea rooms, bakery, ice cream parlour, restaurant /diner, a small convenience store and on Friday evenings there is Ramsey’s Fish and Chips mobile van. There is a shop and the Red Lion Inn at Langthwaite and The Bridge Inn at nearby Grinton.